About two weeks ago I got a surprise package full of Essence and Catrice goodies. Some products are part of the Spring/Summer update and some are part of limited editions. I have been testing them since then, I decided to put all of them in one post and if you want to know what I think about it, keep reading. 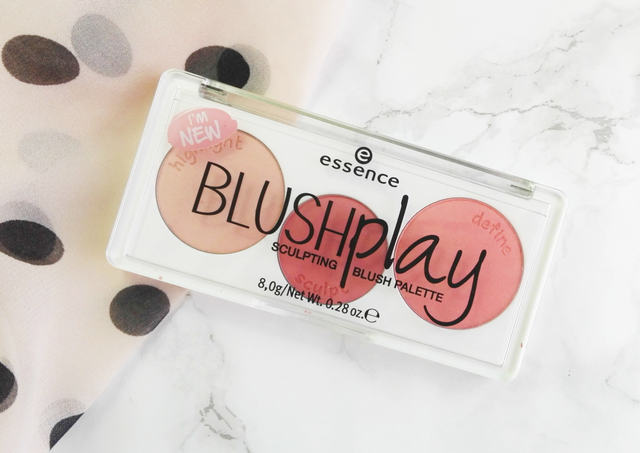 When I first saw that Essence is coming out with a blush palette, it didn't impress me, although I love some of their single blushes. 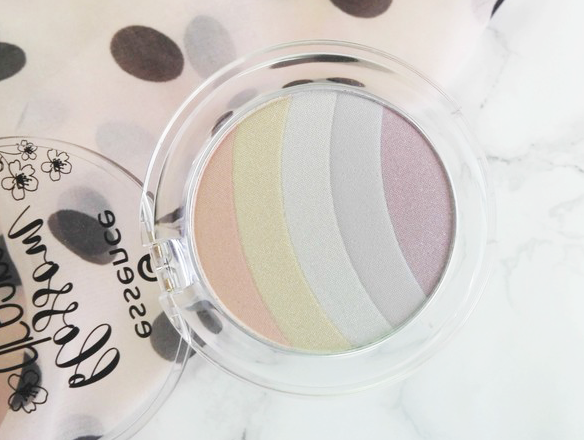 First two shades in the Blush Play palette (highlighter & sculpt) have a powdery texture and are not very pigmented. 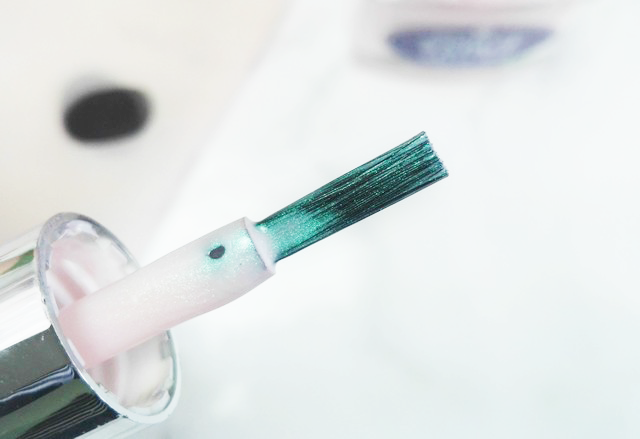 But the last one (define) is completely different, it has almost like a creamy texture and is well pigmented. All shades blend easily. I mostly use sculpt because I adore the colour and I love it. The highlighter isn't really a highlighter, nor a blush, it doesn't do much on my skin. I was very surprised that the shades last all day on my cheeks, they just fade a bit. 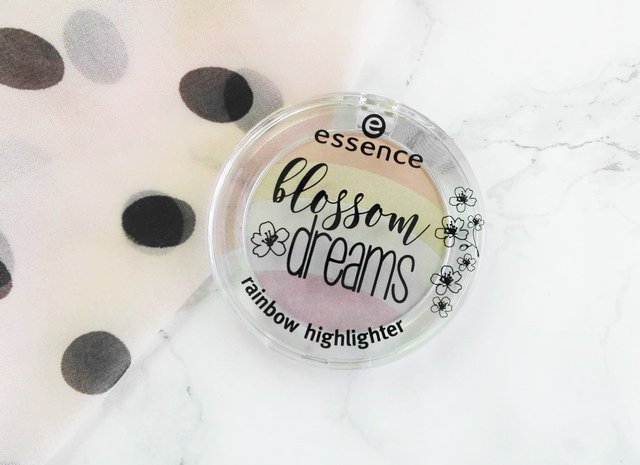 Essence released a rainbow highlighter in their Spring/Summer update, but that one looks very intense, so I didn't plan to buy it, but I would definitely check this one out, that's why I was very happy, when I got it in my mail. Mixed together, the shades give a very nice glowy effect. It is quite shimmery, but I don't mind it, because the shimmer is very fine. If you mix the upper colours, the shade comes out a bit warmer and if you mix the lower colours, then a bit blue toned. 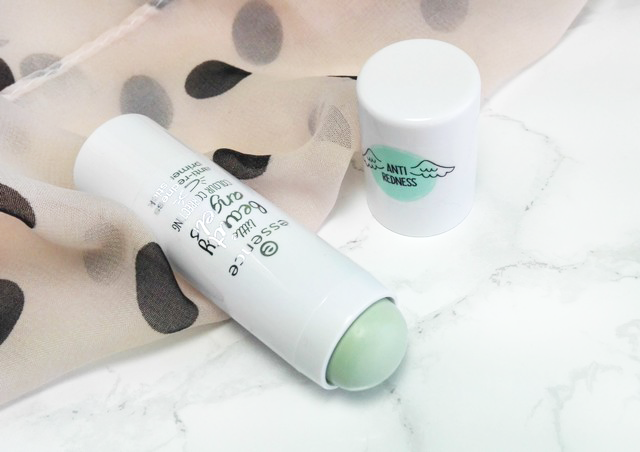 On the picture, it looks white, but on the skin it looks very natural, not white, but don't expect anything special from this product. I was already looking at these type of brushes on AliExpress, but I thought I wouldn't like them. Now that I have tried one, I love it. Practically, you can use it for whatever you want, but I use it for a highlighter and sometimes to apply my blush. I washed it once and a few bristles did fell out. 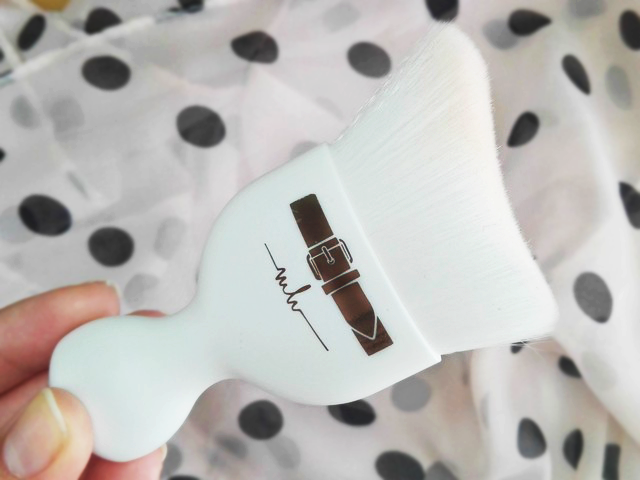 The brush is very soft and it has become one of my favourites. This product looks very similar to something I used some time ago. 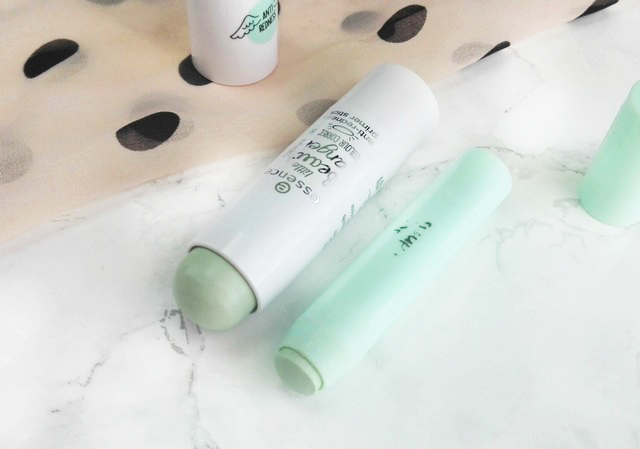 I compared them side to side, the old one is called Say No To Redness Colour Correcting Concealer. The colour of both is almost exactly the same, but the texture its not. This new, which is part of a TE, has a very creamy texture and the old one I have is almost chalky (maybe because I have had it for a few years already). Now when I got a replacement I will throw the old one away. I don't know exactly what to say about this product, I did use the old one and I kind of liked it, but then I completely forgot about it. 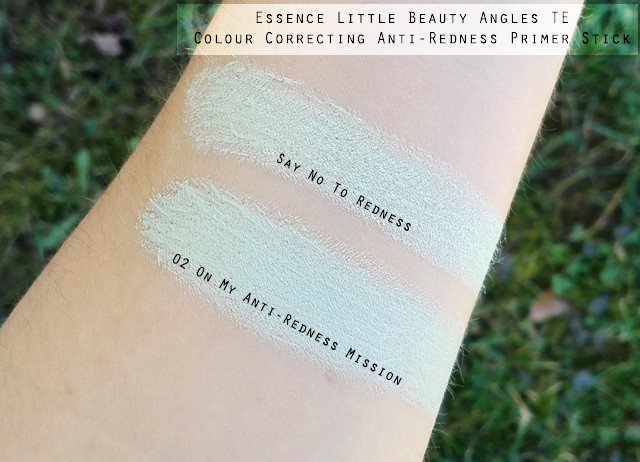 The new one is a lot creamier and blends well, but still, I am not a big fan of colour correcting. I think it looks too cakey of you apply the green concealer and a normal concealer or a foundation on top. 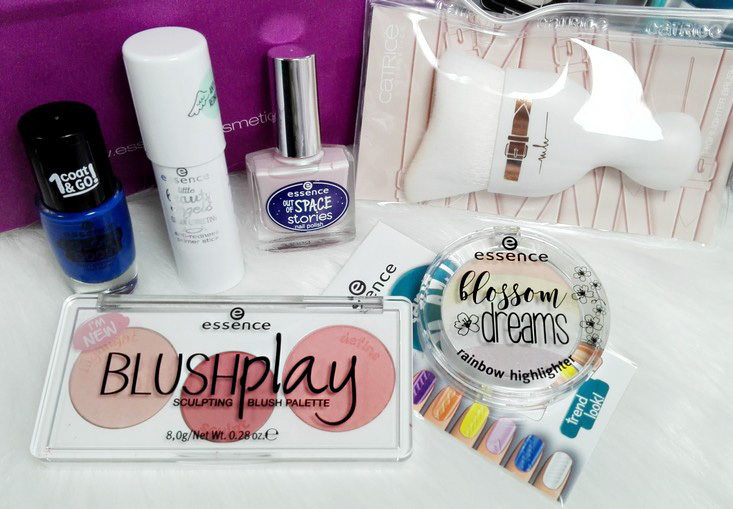 Essence now has a few colour correcting products and there is a liquid green concealer, maybe that one would be better? I actually like the packaging, it's the same as by Prime and Fine Anti-Shine Blur Stick by Catrice and it contains 6g of product. 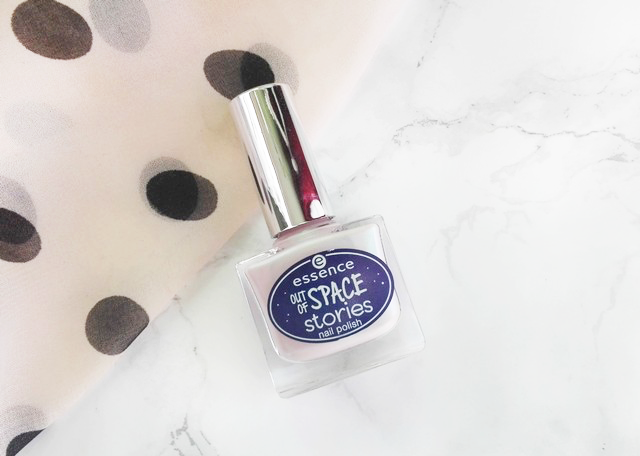 When I got it, I loved the shade, but this nail polish has that weird formula that is so hard to apply. I applied it twice at first and the strokes were still visible, then I applied another coat and it looked uneven. So I removed everything and tried again in a couple of days with very thin coats. I applied four-five coats and it still looked uneven and strokes were visible. I don't know if that's just my clumsiness, but I haven't had such troubles with a nail polish for a long time. But the colour it's gorgeous. On the picture it doesn't look so great, in person, it's like a pearly white, I can't describe it well. It has a very gorgeous effect also. The brush is thin and straight cut. This a such a vibrant colour that I'm not sure if I'm going to wear it a lot, but I do like it on my nails. It's such a vibrant colour that my skin looks very pale on the picture. The brush is thick and round cut. I had problems with it, because of my narrow nails, I got everything on my cuticles. 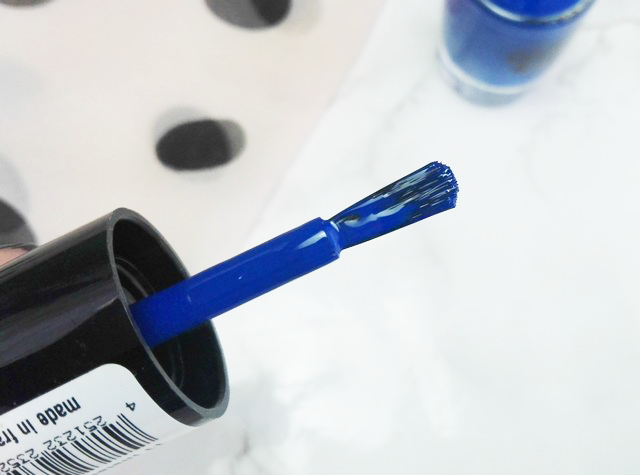 It has a very creamy formula and it is full opaque with only one coat, so it's super pigmented, but that also means it stains. 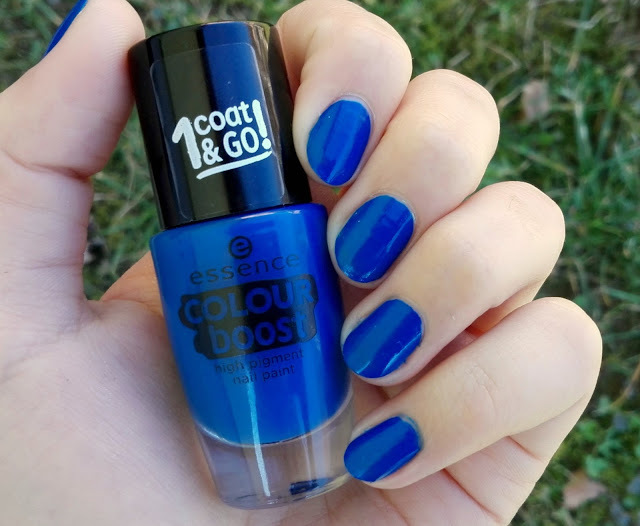 Even when I removed the nail polish I couldn't get the polish off of my cuticles, so I had blue cuticles for a whole day or two, but just on the top. 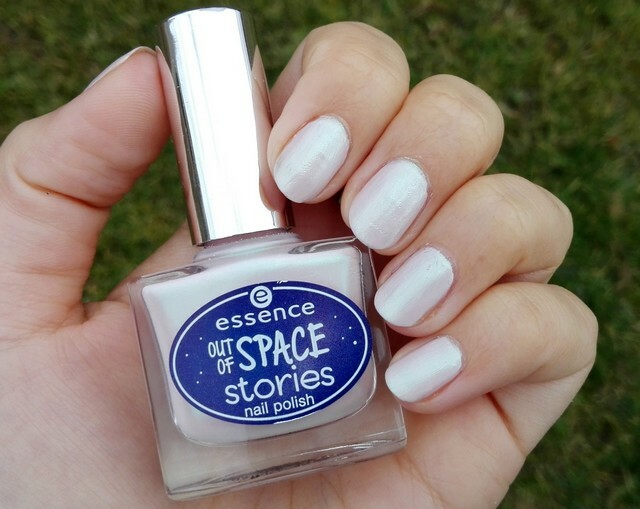 I really like the colour, but I need time to apply it, so I don't get it all over my fingers. 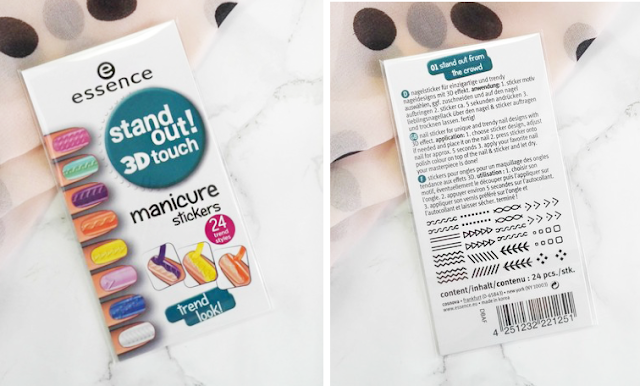 These look interesting, but I'm not a fan of nail stickers. Maybe I will try to use the zik zak pattern and maybe I will even try to do a manicure and post it here on my blog. I don't know exactly what to feel about the colour correcting concealer and the nail stickers, since I don't use them much. 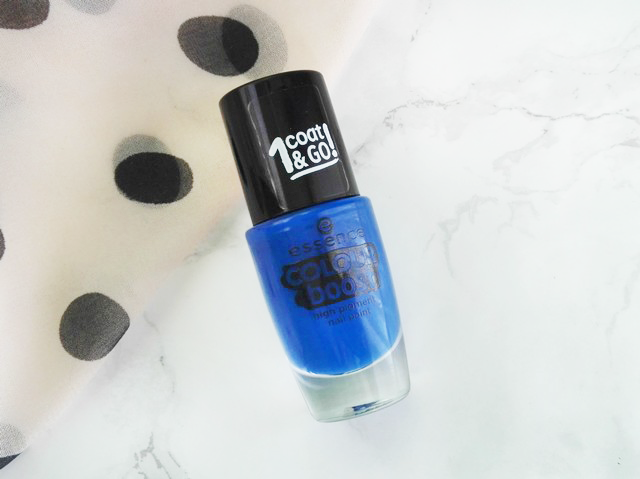 I will probably get more use out of the blue nail polish in the summer time. My favourites are the blush palette, rainbow highlighter and a highlighter blush, which all have become part of my daily makeup routine. 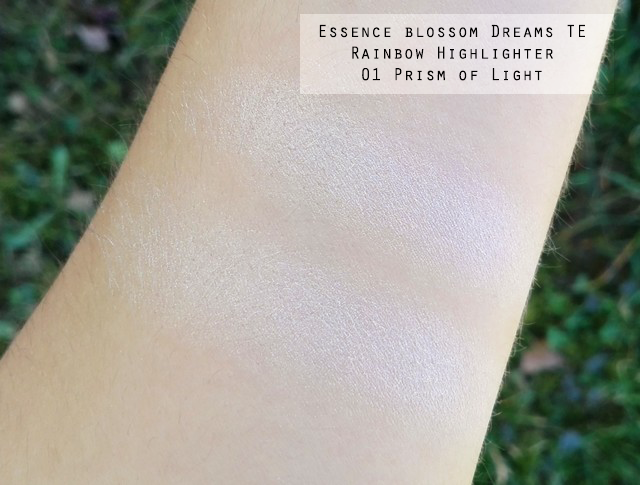 I'm getting more and more into the highlighters and this rainbow one will be perfect for the Spring/Summer season. 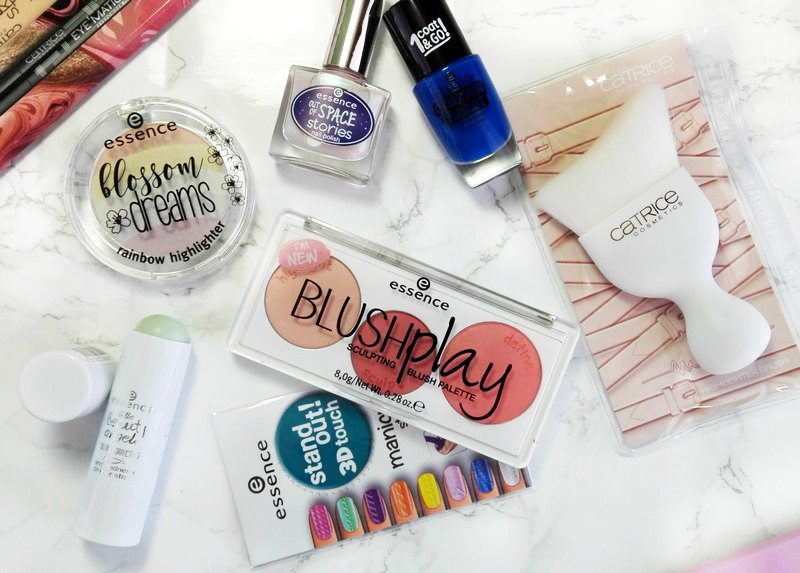 What are your favourite products in Catrice/Essence update? Thank you for reading! Ta paleta z rdečili mi je všeč. In tudi moder lak je res lep odtenek. Meni so všeč taki živahni, čeprav je tudi moje težje sčistiti z nohtov in ponavadi pustijo stain. Mene je zaenkrat presenetil Essence cuhsion liner, ki mi je všeč zaradi tekoče teksture. Pa tudi zelen tekoč korektor je dober. Ni preveč kremast, je dokaj lahkoten :). Zdaj pa me res zanima tekoči zeleni korektor, mogoče bi me bolj potegnil v ta trend :D Me pa mika tudi ta cushion liner, ker še nikoli nisem imela takšnega linerja, da bi ga s čopičem nanašala. 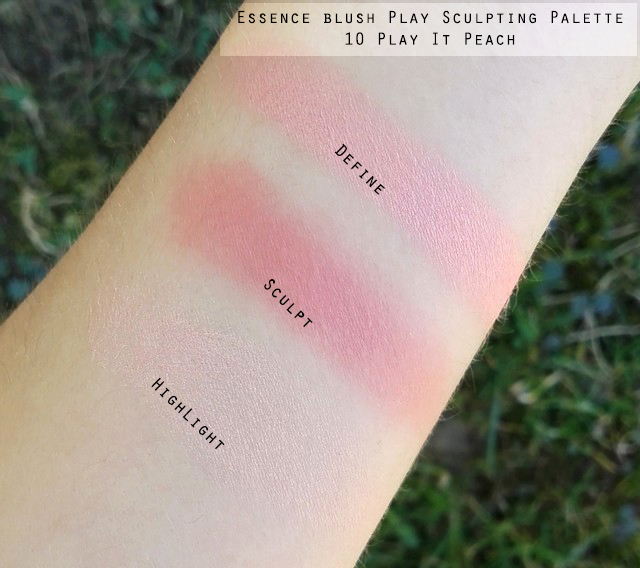 Highlighter iz Play it paletke izgleda čisto drugače na tebi. Na meni je prav živo svetlo breskov. Bi bil pa lahko bolj glowy odtenek. Formula tega Out of Space laka zveni prav tečna. Se spomnim da so bili zdaj že več kot 10 let nazaj taki laki pri S-he. Tudi barva me ne gane. Pričakovala sem približno take odtenke kot so jih imeli v Midnight Masquerade kolekciji, ampak so vsi presvetli. Ne vem, tale prenova me ni ravno navdušila. Fade your Shade šminka je kul odtenek če hočeš nekaj zelo vampy, pa blushi so presenetljivo kvalitetni za Essence, ampak nič mi ni top. Tranformer Drops od Catrice tudi niso izpolnile mojih pričakovanj. Se strinjam, če ga že imajo za highlighter bi efekt res lahko bil bol glowy. Meni pa je barva laka všeč, ampak že vidim, da ga ne bom uporabljala, ker se bom vedno spomnila na to formulo. Škoda :/ Tudi jaz sem pričakovala kakšne take odtenke, edini ki bi mi dejansko spadal v to linijo je tisti črni 1000 light years away.